This wine could have been the result of Southern rap (Ludacris) meeting punk rock (Sid Vicious) … but, in reality this wine has nothing to do with either. Looking again at the label, you might think “oh great, another Pinot!”. Wrong there too … it’s actually “Pinol” … but you’re getting warmer. But hey, there’s no reason you can’t say this is a “Pinol from Spain” — and let the uninformed think it’s Pinot Noir. Pinol is actually not a grape, but the name of a family owning a winery (Vinos Pinol) in a little town in Spain called Batea, within the region of Terra Alta. This is a significant fact of geography, because Batea is in what is called “Zone 5”, and just a hop, skip, and jump away from Priorat, which is a Spanish wine region that produces world-class wines that no one with a nose in Napa Cab has ever heard of. Which is just as well — allow geeks of Spanish wine to continue getting great deals. The grapes in this wine are Garnacha (35%), Tempranillo (30%), Syrah (25%), and Cabernet Sauvignon (10%) — and all can be perceived on the nose, which is vibrant, open, and full of ripe black and red fruits, earth, tar, tobacco, and vanilla. The palate has similar characteristics: wide open, forward, upfront ripe black berry fruit is immediate on the palate, and is followed by spicy vanilla notes before finishing with a mixture of fruit, earth, black pepper, and tobacco. Everything is held together with ripe, mild to medium tannins and mild to medium acidity. By itself, it is interesting and borderline contemplative. With food, its upfront ripe fruit and structure has enough to match with burgers, mac and cheese, leaner meats, such as roast turkey and chicken, turkey or tofu burgers, gamey fish, and grilled vegetables. This might be a bargain bottle for Thanksgiving dinner, and at around $9 qualifies in my book as an Everyday Wine and Great Value. 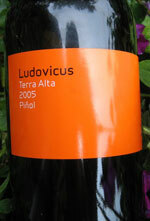 By the way, thanks to David Ogilvie of Purple Lips Wine Log for the bottle photo of Vinos Pinol Ludovicus you see here. He also reviewed this wine, if you’d like to get another person’s opinion.